Forty years ago (this is Jay speaking), I mused aloud that creating stained glass ornaments might be a fun hobby “after I retire.” Mary Ann, who thought I already needed a hobby, gave me tools and scrap glass and pointed out where I could play with them in our Chicago apartment. Soon we moved to South Dakota and a house which happened to have an extra garage that I eventually turned into a studio. One big influence on my transition from hobbyist to window-maker was a serendipitous purchase of several boxes of scrap glass. Not many pieces were more than 2′ square, but it was all German mouth-blown glass, more beautiful than anything I had used. I sorted through the gorgeous scrap to make windows for our bathroom and after installation literally saw life differently. 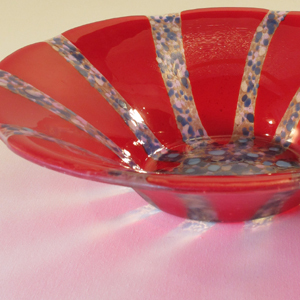 Seeing what was possible with artisan-made glass inspired Mary Ann to work with me. We learned the basics about how to cut glass, lead, solder, and finish windows from books and by seeking out masters of the trade. We visited old line Minnesota studios and attended Stained Glass Association of America conferences, whose members shared freely. The rest came from experience. Designing for glass is part inspiration and part competence. Mouth-blown (“antique”) and hand-poured glass offer wondrous texture and dynamism. I also think about how both view and light will interact with the stained glass. My goal: to bring together light, motion, and color to enhance the environs. I find joy in both the art and the craft of stained glass. I become one with the glass and we breathe together: scoring, breaking, leading, soldering, cementing, cleaning. Jay now fabricates all windows, art panels, mirrors, lamps, light vessels, and all else leaded or foiled that we design. (Mary Ann is speaking now.) Jay likes to cut glass and is technically very skilled so after we moved to Pennsylvania I left that to him and focused on designing. We talk over ideas and decide which of us will design a project. While our styles differ we both strive to convey glass’ liveliness and sensuality. The finished piece should bathe its users in transformed light, providing atmosphere, not merely something to look at. My style echoes natural shapes, plays with interlacing lead-lines, and flows color and texture abstractly through the design. Our newest passion is fusing and slumping glass–assembling flat glass and frit (ground glass), melting it together and forming it in a kiln. We enjoy the direct method of working, an ability to achieve painterly effects in the fused glass, and the creation of beautiful items for everyday use. What we love shows in our glass, whether it is leaded, foiled, or fused.